I've been tinkering with my Thomson SpeedTouch 510, FW v. 6.2.15.7. 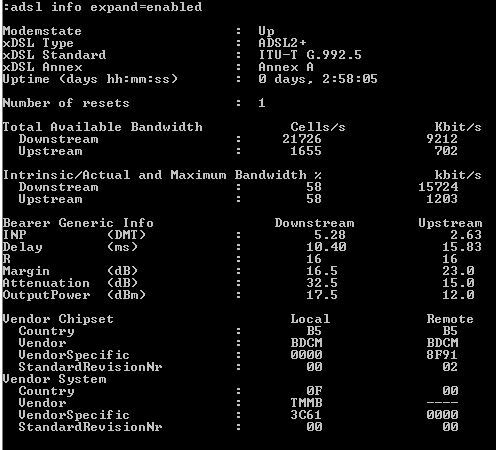 What does "Total Available Bandwidth" stands for? For reference, my ISP plan is 4mbit/s downstream and 0.4mbit/s upstream. Are those values in the output the highest possible bandwidth between my modem and the DSLAM? Also, what would be the difference between it and "Intrinsic/Actual and Maximum Bandwidth"? "Intrinsic/Actual" refers to "the ratio of total bandwidth to maximum bandwidth." It is the right-hand value under Kbit from "Total Available Bandwidth" divided by the right hand value on the "Intrinsic/Actual and Maximum Bandwidth" line. I verified this on a calculator, and it comes out to 58.5% downstream and 58.3% upstream, so the output rounds down. "Total Available Bandwidth" is the maximum burst of data that could physically happen per second. Your modem has negotiated this speed with the provider's hardware to come up with an acceptable attenuation level (32.5 dB is respectable). Increasing speed also increases attenuation, so your modem selected a value that provides the best balance between speed and signal quality. Your actual speed, of course, is 4Mbit right now. The available bandwidth only shows what the maximum possible burst of data could be, if you were not capped by your provider to remain at the 4Mbit speed. Your modem could transfer 15724Kb/s if conditions were ideal (e.g. you were physically closer to the CO and/or the line had better noise quality, say, closer to 20 dB attenuation). Not the answer you're looking for? Browse other questions tagged bandwidth adsl dsl-modem adsl2+ or ask your own question. how to calculate download speed from total bandwidth? In bmon (bandwidth monitor),what is the difference between interface bandwidth and qdisc bandwidth?